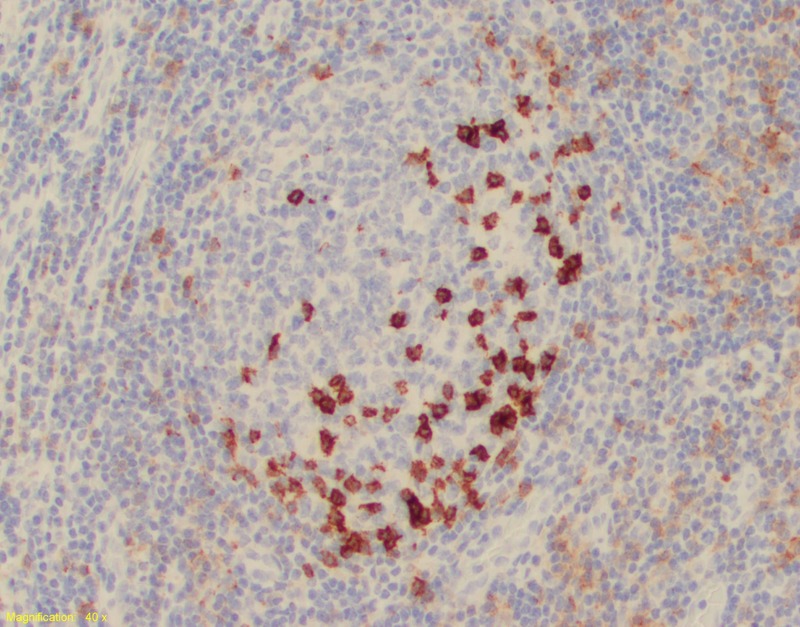 Mouse monoclonal PD1 antibody [NAT105]. Validated in WB, IP, IHC, Flow Cyt, ICC/IF and tested in Human. Cited in 82 publication(s). Independently reviewed in 8 review(s). 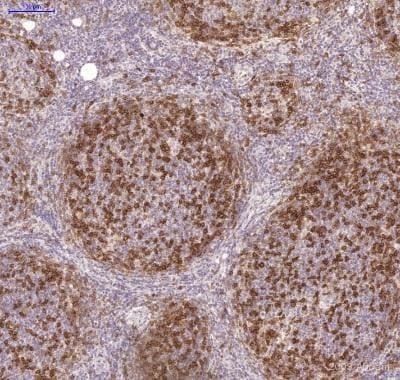 This antibody recognizes human PD1, a checkpoint protein expressed by activated T and B cells. PD1 is involved in the control of immune cell responses. IHC-P: Human tonsil tissue. ICC/IF: MOLT-4 cells. Flow Cyt: Human tonsil extract. MOLT-4 cells. IHC-Fr: Human tonsil tissue. Please note that PD-1 is expressed variably in different tissues and that optimisation may be required depending on the tissue used for the experiment. Due to low expression of PD-1, we recommend loading a high amount of sample (100 µg) to detect the band for PD-1. Human tonsil and YT cell line lysates are suitable positive controls. This antibody clone [NAT105] is manufactured by Abcam. If you require a different buffer formulation or a particular conjugate for your experiments, please contact orders@abcam.com. Our Abpromise guarantee covers the use of ab52587 in the following tested applications. WB 1/50. Predicted molecular weight: 32 kDa. 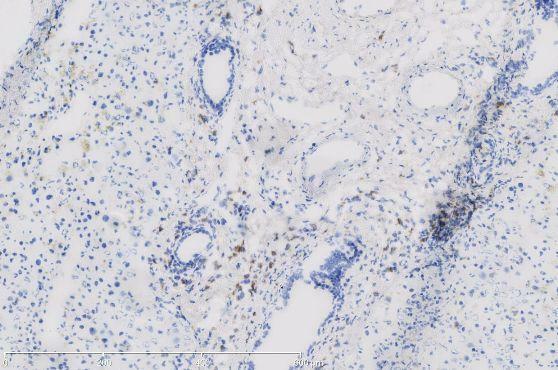 We recommend Goat Anti-Mouse IgG H&L (Alexa Fluor® 488) (ab150117) secondary antibody. IHC image of PD1 staining in normal human tonsil formalin fixed paraffin embedded tissue section*, performed on a Leica Bond™ system using the standard protocol F. The section was pre-treated using heat mediated antigen retrieval with sodium citrate buffer (pH6, epitope retrieval solution 1) for 20 mins. The section was then incubated with ab52587 at 5 µg/ml for 15 mins at room temperature and detected using an HRP conjugated compact polymer system. DAB was used as the chromogen. The section was then counterstained with hematoxylin and mounted with DPX. Double immunofluorescence staining of CD3 (green) and PD1 (red) on paraffin embedded tonsil. Dilution: ab52587 antibody was used as 1/200 in 1x106 cells/tube. 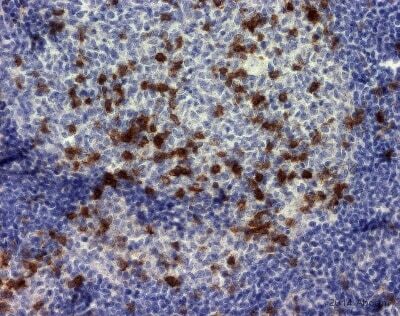 Formaldehyde-fixed, paraffin-embedded human follicular lymphoma tissue stained for PD1 with ab52587 at 1/100 dilution in immunohistochemical analysis. Western blot - Anti-PD1 antibody [NAT105] (ab52587)This image is courtesy of an anonymous collaborator. Immunohistochemistry (Formalin/PFA-fixed paraffin-embedded sections) - Anti-PD1 antibody [NAT105] (ab52587)Kim et al PLoS One. 2013 Dec 11;8(12):e82870. doi: 10.1371/journal.pone.0082870. eCollection 2013. Fig 1. Immunohistochemical analysis of various soft tissue sarcomas staining PD1 using ab52587 at a 1/50 dilution. Arrows indicate PD1 positive lymphocytes. Paraffin-embedded human tonsil section stained with ab52587 at 1/50 dilution. Overlay histogram showing MOLT-4 (Human lymphoblastic leukemia cell line) cells stained with ab52587 (red line). Live cells were incubated in 1x PBS / 10% normal goat serum to block non-specific protein-protein interactions followed by the antibody (ab52587, 1/100 dilution) for 30 min at 4°C. The secondary antibody used was Alexa Fluor® 488 goat anti-mouse IgG (H&L) (ab150117) at 1/2000 dilution for 30 min at 4°C. A mouse IgG1 isotype control antibody (ab170190) was used at the same concentration and conditions as the primary antibody (black line). Unlabeled sample (blue line) was also used as a control. MOLT-4 (Human lymphoblastic leukemia cell line) cells stained for PD1 (colored green) using ab52587 in ICC/IF. Cells were fixed with 100% methanol (5 min) at room temperature and incubated with PBS containing 10% goat serum, 0.3 M glycine, 1% BSA and 0.1% Tween-20 for 1 hour at room temperature to permeabilize the cells and block non-specific protein-protein interactions. The cells were then incubated with ab52587 at 10 µg/ml and ab6046 (Rabbit polyclonal to beta Tubulin - Loading Control) at 1 µg/ml overnight at +4°C. The secondary antibodies used were Goat Anti-Mouse IgG H&L (Alexa Fluor® 488) (ab150117) secondary antibody used at 1 µg/ml (colored green) and Goat Anti-Rabbit IgG H&L (Alexa Fluor® 594) (ab150080) secondary antibody (pseudo-colored red) used at 2 µg/ml for 1 hour at room temperature. DAPI was used to stain the cell nuclei (colored blue) at a concentration of 1.43 µM for 1 hour at room temperature. 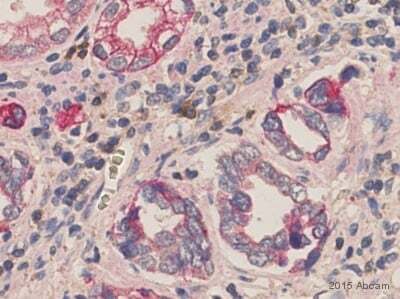 Immunohistochemical analysis of human large and locally advanced breast cancers staining PD1 using ab52587. (Panel a) Low level of PD-1+ T cell infiltration. (Panel b) high level of PD-1+ T cell infiltration. (Itu: intratumoral Str: stromal). Double immunoenzymatic staining of Ki67 (brown) and PD1 (red) on paraffin embedded tonsil. Human tonsil tissue stained for PD1 with ab52587 incubated for 30 mins at a 1/100 dilution in immunohistochemical analysis. 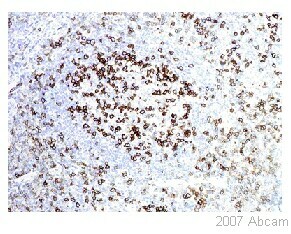 Immunohistochemical analysis of frozen human liver tissue labeling PD1 with ab52587 at 1/50 dilution. Immunohistochemistry (Formalin/PFA-fixed paraffin-embedded sections) - Anti-PD1 antibody [NAT105] (ab52587)Schmidt et al PLoS One. 2015 Aug 27;10(8):e0136023. doi: 10.1371/journal.pone.0136023. eCollection 2015. Fig 1. Representative immunohistochemical staining results for PD1 using ab52587 at a 1/50 dilution in human formalin-fixed, paraffin-embedded tissue specimens. Panel D: PD1-positive tumor infiltrating lymphocytes in squamous cell carcinomas). Immunohistochemistry (Formalin/PFA-fixed paraffin-embedded sections) - Anti-PD1 antibody [NAT105] (ab52587)Argüello et al PLoS Negl Trop Dis. 2014 Aug 21;8(8):e2989. doi: 10.1371/journal.pntd.0002989. eCollection 2014 Aug. Fig 2. Expression of markers of T cell differentiation and degree of inflammation in the heart of chronically T. cruzi-infected subjects with severe cardiomyopathy. A–D, left panel: representative photos of CD45RO, CD27, PD1 and CD57 expression, respectively. Publishing research using ab52587? Please let us know so that we can cite the reference in this datasheet. Since ab52587 is a mouse monoclonal I was wondering what secondary to use? We would like to titrate the Ab and am not sure how to go about doing it. If you are concerned about the titration of the antibody, I would suggest trying the experiment with a range of different concentrations. Can you tell me what the epitope of the antibody is directed against, or at least whether the antibody binds extracellular or cytoplasmic? We plan on running protein interaction studies, so we would need that information. I can confirm that the epitope of ab52587 is extracellular, because in FACS experiments fresh, unfixed cells were used.